The Beatles Page: An informative, educational, inspiring look at the most important rock band of all time. 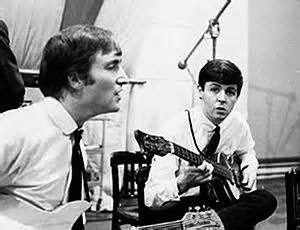 The Beatles in the Studio -- Song 8 -- "All My Loving"
As with most of our "Beatles in the Studio" blog article series, feel free to listen to the song while you read -- a link is provided at the bottom of the page! This song was recorded very early on in album sessions, first only meant to be recorded as "album filler" for the Beatles follow up album, not really considered a single. When it was broadcast for the first time on Britain's "Top of the Pops", a popular BBC show hosted by David Jacobs, the potential of this song was realized due to the fan response. It eventually became a Beatles classic, and in fact, was used as the opener for the Beatles first appearance on the Ed Sullivan Show in 1964. The song was nearly always included in Beatles concert set lists and often played live during Paul McCartney's solo career. When performed by the Beatles, George sang the harmonies in the 3rd verse (originally triple tracked by Paul in the studio). Interesting: Although this song was in fact Paul's composition -- in 2005 Cynthia Lennon wrote that she believes that the song was written by John for her (it was not). "All My Loving" was conceived sometime between May 18 and June 9, 1963 while the Beatles were on their 3rd national tour with Roy Orbison. According to Paul he wrote the lyrics on the bus - "it was the first song where I wrote the words without the tune" - and those lyrics were inspired by actress Jane Asher, whom Paul met a month earlier on April 18, 1963. "All My Loving" was one of the earliest rock and roll songs in which the lyrics were written in the form of a poem, which eventually became a fairly normal practice, or at least a viable writing option for many singer/songwriter teams. According to John Lennon -- "'All My Loving' is Paul, I regret to say. Ha ha ha. Because it's a damn good piece of work...but I play a pretty mean guitar in the back." With this song, John really discovered the individual songwriting talent of Paul McCartney as an inspiring competitive force to be reckoned with when it came to writing singles. -Paul double tracked his own voice (you can easily hear this at 0:27 at "kissing" and also at 0:35 on "will come true". -Paul triple tracked his own voice for harmonies in the 3rd verse. -John's skill at rhythm guitar began to emerge - his backing rhythm guitar was in triplets, reminiscent of the Crystals "Da Doo Ron Ron" - "A superb piece of guitar" as John said himself. -George used his Gretsch Country Gentleman to play one of his first excellent Chet Atkins style solo's that used prolifically in the early days. Included below is the studio version, stereo remastered, as well as the Ed Sullivan premier - the first glimpse of the Beatles live in America! The Beatles in the Studio -- Song 7 -- "This Boy"
"This Boy" was a minor Beatles hit and was actually the B-side of their breakthrough "I Want to Hold Your Hand". 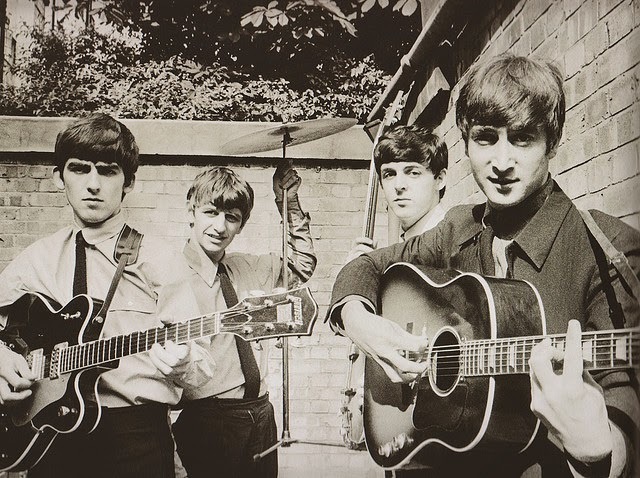 As a result, although never an A-side song, "This Song" received plenty of airplay - enough airplay to hit the American charts as a B-side - the first indication of the Beatlemania craving that was soon to dominate the hearts and minds of worldwide youth. This song was written in a hotel room on the road, in much the same way as they had written their early classic, "She Loves You" -- both John and Paul sitting on their hotel beds facing each other in a typically British olive and green hotel room -- "the colors of vomit". 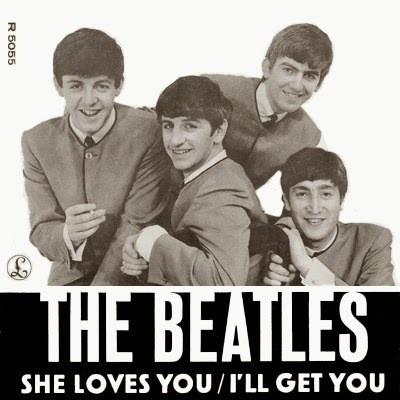 According to John and Paul, the influences for this song included Smokey Robinson and the Miracles "I've Been Good to You" and The Teddy Bears "To Know Her is to Love Her". What was so significant about this song was that it was one of only (3) songs the Beatles actually wrote for tight 3-part Harmonies - from the start. The Beatles of course were renowned for their harmonies, they were quite good at them - but along the way, most of the harmonies were added after the song writing process, during the creative studio process. But this one was created for the tight harmonies of John, Paul and George from the get-go. In fact, "This Song" was one of only (3) songs written for 3-Part Harmony, including "Yes it Is" and the ethereal "Because" 7 years later on the legendary "Abbey Road" Album. This song was one of the very early indication of their rapid musical maturity in the studio. They worked on this song immediately after completion of "I Want to Hold Your Hand". It took 15 takes and only two overdubs to reach satisfaction. Listening to this song (click below, nice old lip-synch video) - it is quite clear that the overdubs were likely to increase the power of John's middle eight verse. According to the legendary engineer (assistant then) Geoff Emerick, the team was extremely impressed and surprised by the fact that the Beatles sang each take in perfect three-part harmony, almost every time, from first take to last. 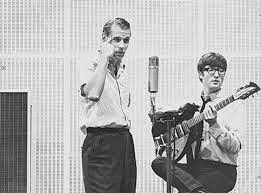 George Martin was again unhappy with George Harrison's rather uninspired guitar solo during the bridge, which opened up John to belt out a powerful vocal there instead. According to Paul "Nice middle, John really sang that great". 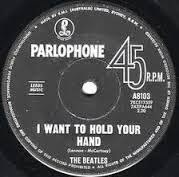 The Beatles in the Studio -- Song 6 -- "I Want To Hold Your Hand"
Although Beatlemania was in full force in the UK with the success of "She Loves You", "I Want To Hold Your Hand" is the song (the single) that actually gave birth to Beatlemania in the United States. In Great Britain alone, when the single was released, it already had prior sales of over 1 Million copies. In the U.S. despite refusal by Capitol records to release it, the song was heard on nearly ALL American radio stations - a release by Parlophone -- which was started by the actions of Washington disc jockey Carroll James, who found the UK single and aired it at the persistent request of a young female listener. After the first broadcast, the popularity went "viral" - no small feat prior to the computer age. In the face of such public enthusiasm, nearly ALL radio station followed suit. Of course the single became number 1 by January 10 after a December 26 release. Not far behind it was the B side of the single "I Saw Her Standing There". The rest is history, one of the most remarkable and meteoric rises to fame and glory as has ever been told in entertainment history. In NYC it was estimated that approximately 10,000 copies of "I Want To Hold Your Hand" were sold every HOUR. In the end, by the time the single began to drop off the charts, it had sold more than 5 million copies. The Beatles first American tour was quickly planned and organized for February, 1964, including the booking of the Ed Sullivan show. This song that really launched the meteoric career of the Beatles was actually written the night before it's recording, on the evening of October 16, 1963, in the little music room at the Asher family home (Paul's actress girlfriend) at 57 Wimpole Street in London. John and Paul both were sitting at the family piano at the same time, and they hammered out the simple melody. Eyeball to Eyeball writing. This was the Beatles first recording using a 4 track recorder (Telefunken T9u and M10 recorders). They were able to record the rhythm first, then concentrate on the vocals - and finish with the trademark "Hand Clapping" in a joyous atmosphere (you can really hear the smiles in the claps). The 4 track machines allowed a level of composition/creation in the studio (rather than try to move through a complete song in 1 take) -- the Beatles were soon to take advantage of this and bring studio recording and the level of creativity possible in a studio to new heights. The Beatles in the Studio -- Song 5 -- "She Loves You"
"She Loves You" is the first single released after their successful "PLEASE PLEASE ME" LP. This single is the one which most people remember as it was released; it was wildly successful both in the UK and the United States, and is the first Beatles single to sell a million copies! The recording of this song at Abbey Road also marked a turning point in the Beatles career. During the day, the Beatles were posing for pictures in the alleyway. Geoff Emerick remembers that the size of the crowd outside was larger than usual, and was in fact growing. By the time the Beatles went inside to record the single, fans had overrun the EMI security at Abbey Road, and dozens of hysterical girls were racing down the halls of the facility, being chased by London bobbies with sticks, LOL. This is the beginning of the Beatles becoming virtual prisoners in the studio, the loss of freedom, the beginning of incarceration. The first song to be credited to Lennon/McCartney (as opposed to McCartney/Lennon in all previous songs). 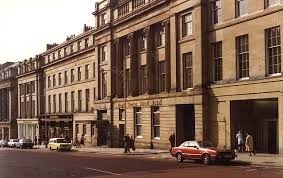 "She Loves You" was written in a room of the Turks Hotel in Newcastle-upon-Tyne, sitting on facing twin beds after a concert at the Majestic Ballroom. They had written the song and according to John, they needed more so they added "yeah, yeah, yeah" and it caught on, as well as the "woo woo's" which came from Twist and Shout. According to Cynthia Lennon, the "Yeah, yeah, yeah" came from a love letter from John to her which included the message "our first Christmas, I love you, yes, yes, yes." Whatever, for the first few albums and live performances, the "Woooo, Woooo!!!!" and "Yeah, Yeah, Yeah!" became scream inducing Beatle trademarks. "Oh Yeah" continued through their final "Abbey Road" LP (Last song, Golden Slumbers). 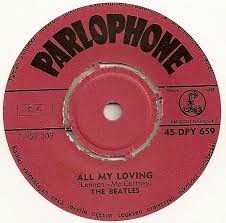 The song was released as a single in the UK on August 23, 1963 and reached number 1. The song was released as a single in the US on September 16, 1963 and reached number 1. Recorded on Twin Track BTR3 tape recorders (two-track). Vastly improved recording method implemented by Norman Smith. -Began using a compressor to limit significant divergence in level (started with the last song on PLEASE PLEASE ME, "Twist and Shout") which became a rock recording standard practice eventually. -Moved the vocal microphones even farther from the drums. This configuration would be the one he used until he stopped working with the Beatles in 1965. The Beatles in the Studio -- Song 4 -- "Misery"
"Misery" was a simple "McCartney/Lennon" composition (it wasn't until after "She Loves You" was released that the famous "Lennon/McCartney" tag began to be used). The song was crafted initially as a song for British Pop Star Helen Shapiro to sing. Helen Shapiro had a couple of charted hits at the time, and was part of their tour, so John and Paul thought that if they wrote a song for Helen to sing, then that would have been a coup (exposure!) for them as fledgling songwriters! Important: It's important to note that in addition to being musicians and rockers, the Beatles -- especially John and Paul -- considered themselves SONGWRITERS -- a very important distinction for them. This is what they wanted to be - they began that way. In the end, Helen's manager Norrie Paramor turned it down without telling Helen. Eventually, another tour mate, Kenny Lynch, ended up singing the song, making it the first Beatles song to ever be covered. The significance of "Misery" is that it also represented a technical "first" in the studio, concerning the George Martin overdub, which involved the change of speed of recording to gain a specific sound quality, see below. The "Please Please Me" album sessions were amazing. The Beatles, fresh in from a UK tour the night before, were exhausted. John Lennon was worse than exhausted, he was flat out sick, having a sore throat and fever - relying heavily on a box of cough lozenges next to his carton of cigarettes. Despite all this, they began at 10:00 AM in Studio Two at Abbey Road, and by 10:45 PM had finished all 11 songs for the LP! Simple crafted song originally written for British pop star Helen Shapiro, written backstage at King's Hall while on tour in Stroke-on-Trent, finished at Paul's Forthlin Road house together. It was eventually covered by Kenny Lynch, becoming the first Beatles song to be performed by another artist! Recording Session for LP "PLEASE PLEASE ME"
Overdub of piano to replace George Harrison's faulty guitar riff. Modifying recording and playback speed to create an effect. In this case, the final take of the song was recorded at double speed, 30 ips (inches per second) -- so that on February 20 George Martin could replace George Harrison's faulty guitar solo and record a piano fill/overdub at half speed (15 ips), then speed up the playback at 30 ips to create a crystal sound that resembled a honky tonk or harpsichord. He added reverb while playing, which further effected the playback at double speed. Martin used this technique repeatedly, including the famous piano solo in "In My Life" in 1965. The Beatles in the Studio -- Song 3 -- "I Saw Her Standing There"
This is the Beatles very first song on their very first album, "Please Please Me", released in 1963. After the initial success of the first single, "Love Me Do" (see our post for Song 2) which became apparent shortly after it's October 1962 release, George Martin decided to follow with an album as soon as possible. George's initial thoughts were to try to capture the raw energy of the band as they performed live. In order to achieve that "live" sound, George initially considered recording in the Cavern Club in Liverpool, where the Beatles were performing often and their power could be felt. Ultimately though, the acoustics in the Cavern Club were not good enough so he turned to the Beatles first engineer, Norman Smith (whom John affectionately called Normal Smith), who came up with the unique solution of trying not to "isolate" each of the instruments, placing the microphones 15-20 feet away from the cabinets - not the typical recording method of the time. And there, you have the first sign of what was to come over the next 8 years; the first innovation, the first step "outside the box". These innovations came slowly at first, but with each album and each song, they accelerated rapidly and heavily influenced the creative environment of Rock recording. This song was principally written by Paul McCartney in July of 1962 while returning from a concert in Southport - thinking about his 17 year old girlfriend, Iris Caldwell (who was also the sister of Rory Storm - who had Ringo Starr as his drummer on his backup group, the Hurricanes). The song was finished with John in Paul's living room at 20 Forthlin Road in Liverpool in September 1962 - John as usual helped with the final lyrics and changes needed to make the song fluid. The bass line was inspired (actually lifted) by the song "I'm Talking about You" by Chuck Berry - note for note, according to Paul. First attempt at re-creating the sound of a "live" rock and roll performance through microphone placement. Recorded on Twin Track BTR3 tape recorders (two-track). Overdubs (hand claps) accomplished by using two tape recorders. This is the Beatles very first recording session at Abbey Road under the tutelage of producer George Martin. The recording occurred over two separate days - Tuesday, September 4, 1962 and 7 days later Ringo was replaced by Andy White -- a session drummer inserted because George Martin was not pleased with Ringo's consistency at first. This recording session was a direct result of their successful audition on June 6, 1962. 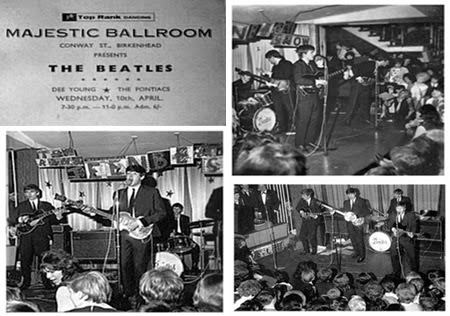 The Beatles lineup on that day was John, Paul, George and Pete Best on drums, but on September 4 Pete Best had been already replaced by Ringo Starr on the tracks laid down that day, and on September 11, Ringo was forced to watch while shaking a tambourine as Andy White replaced him for their first single - a crushing blow to Ringo at the time. "Love Me Do" was not supposed to be the Beatles first single. George had them scheduled to play and record a song called "How Do You Do It" by Mitch Murray because he was unaware of Lennon and McCartney's formidable songwriting skills early on, and felt that "How Do You Do It" would likely be their first chart-breaking hit. They did it, but also demanded that they give "Love Me Do" a try. The Beatles considered this song "schlock" and demanded they perform their own compositions - unheard of at the time. But the results are evident, and were ground-breaking for the future of rock and roll songwriting. The breakthrough Beatles single "Love Me Do"/"P.S. 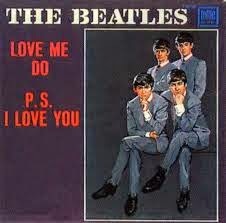 I Love You" was released on October 5, 1962 - and by December 1962 "Love Me Do" had peaked at number 17 on the UK charts. In 1964, after The Beatles fame had hit U.S. shores, the song became a No. 1 hit on the U.S. charts. In 1982, it was re-promoted and reached No. 4 (amazing). This song was principally written by Paul McCartney in 1958-1959 while truant from school at age 16. John Lennon is credited with writing the middle 8. The practice at the time was to write song lyrics in a school notebook. The song was based on two simple chords, G7 and C, before moving to D in the middle eight. 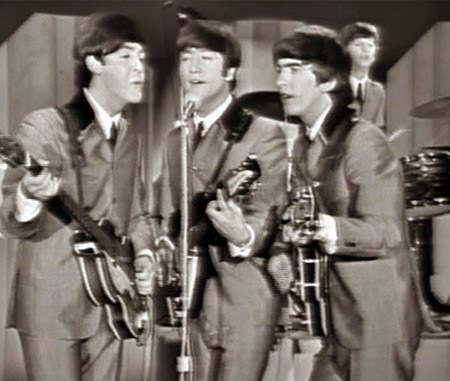 It originally featured Lennon and McCartney sharing the vocals, with Lennon singing the original title lines, and Lennon wanted a bluesy "dockside harmonica riff" as part of the song. John Lennon -- 1958 Rickenbacker 325 Capri, Gibson J160E Acoustic/Electric, stolen harmonica from a dutch music store in 1960. Historical. First formal recording. First recording of original Lennon/McCartney music.